In March, I had the awesome opportunity to head down to Asheville with fellow wedding blog editors to get to know the Asheville wedding community thanks to StudioWed and Hilton Asheville. Basically, we all fell in love with the mountain community and when I started talking about it in Hampton Roads, apparently I wasn't the only one smitten! So for our next in our series, The Little Honeymoon Guide, we're sharing the scoop on favorites when visiting or honeymooning in Asheville, North Carolina. It's not a comprehensive guide, but a collection of recommendations that are a mixed collection of "off the beaten road" to "iconic" from fellow Virginian wedding pros. Meredith of Memories by Mere Photography absolutely loves French Broad Chocolates, a hand-crafted artisanal chocolate lounge serving incredible sweets with a company focus on sustainability, community, and quality. Like most of Asheville, this quant open kitchen restaurant is a local legacy built in the 1890's. The Corner Kitchen is known for locally-sourced and seasonal ingredients and fresh menus all in a cozy environment. I especially loved the gluten-free options and accommodations available, including a fudgy gluten-free brownie for dessert! If you're looking to venture a little outside of Asheville (just 10 miles! ), the Native Kitchen and Social Pub is a great spot for good food, good music, and good local vibes. Jill of Sunkissed Events especially loved the homey ambiance and beer choices! You can't not go to Asheville and not visit the American Downton Abbey! "BILTMORE!" Crystal of High Voltage Hair (aka history buff) exclaimed, "It's a must to get the 2-days pass because there was so much to see and do." "For those looking to work a little rock n roll into their honeymoon," Tyler of The Girl Tyler suggests, "The Orange Peel is a great concert venue that gets a ton of good shows." For the more adventurous couple who loves the outdoors (which is a huge reason to go to Asheville! ), Jill of Sunkissed Events loves Navitat. It's 100% tree-based zip lining that you can do with your spouse as the ultimate adrenaline couple activity! I've been a long-time member of the Hilton HHonors loyalty program, so I knew off the bat that the Hilton at Biltmore Park would live up to high standards and great customer service when we stayed there. But what really made it an incredible experience was the concierge service including the courtesy van to take you around Biltmore Park, a shopping and foodie hot spot, as you wished. It was a completely unexpected and appreciated perk! "About a 10-15 minutes drive from Asheville, we found these adorable cabins at Cheshire Resort perfect for the honeymooners who love nature and hiking! We loved the fireplace and the outdoor porch," Jill of Sunkissed Events recommends. For completely breathtaking views, the historical Grove Park Inn boasts breathtaking views of the Blue Ridge Mountains. With over 100 years of luxury accommodations, time has clearly told this is a favorite amongst honeymooners and vacationers alike. Even ask about the resort's 1917 navy blue Cadillac that they just so happen to have! It's gorgeous! 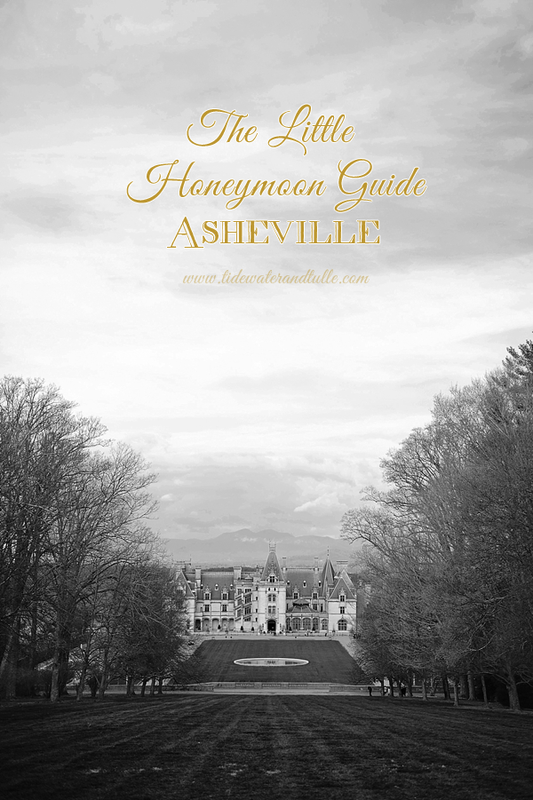 It's the ultimate wedding blog and online resource for anything wedding-related in any mountain region, including Asheville. So if you want ideas on what the mountain life is all about, head over to Mountainside Bride. Christie knows her high altitude-lovin' community better than anyone I know! Accommodations and activities were all provided by Hilton Asheville and StudioWed, and the opinions are all genuine through personal experiences and the photo featured in this post is my own (Bit of Ivory Photography).